A fascinating look into the music, the style and vibe of New York City. Learn about networking, branded marketing and how to profile your signature style from a trio of experts. 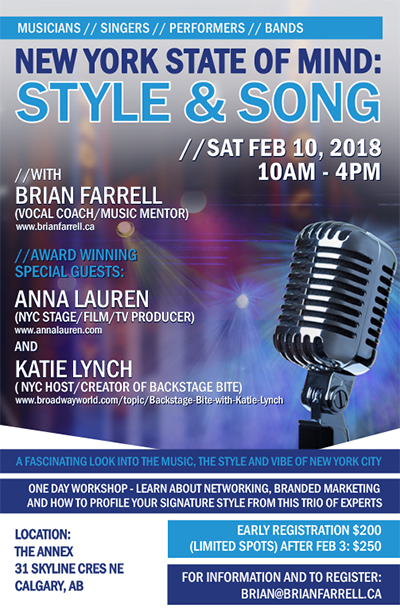 Join Brian Farrell (Vocal Coach, Music Mentor) AND special guests: Anna Lauren: award winning New York creative producer with Refinery29 and Katie Lynch: New York creator of the unique Broadway World’s “Backstage Bite”. What happens with the stars of Phantom of the Opera, Come from Away, Cats and more arrive at your doorstep, ready and willing to be your sous chef? Ask, Katie Lynch! 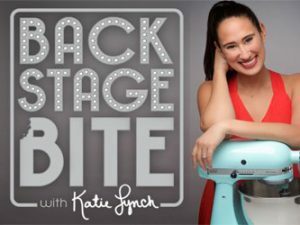 For years Katie's been the hostess with the mostess on Broadway World welcoming some of the top tier stars to her very own kitchen. Her show, Backstage Bite, has engaged with hundreds of thousands and she very much has become a friend of the stars. Because! What brings people together more than cooking a meal? Beyond this, Katie has been in the press room at the Tony's and pretty much every backstage dressing room on Broadway connecting, inspiring and getting to know some of the industry's top talent. Do you need to be an influencer on social media with upwards of 10k followers to make it as an artist? Anna Lauren, of Refinery29, a leading global media company, will tell you what she believes engenders success as an artist. 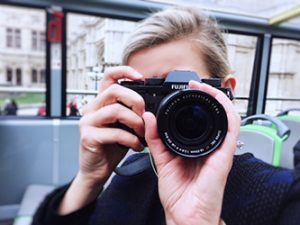 With experience producing alongside a company that has hosted Hillary Clinton, Fergie, Yara Shahidi, a box on the SAG awards red carpet, and many social media stars and influencers, Anna Lauren's perspective on publicizing yourself on social media in tangent with the developing of artistry is invaluable. Her short film was recently nominated for an Annie (top animation awards ceremony globally) alongside films like Coco, and her experience working with world class directors and fellow producers offers insight into what the top caliber of producers look for in young talent. She's also been in the room pitching content to some of the biggest hollywood studios and production companies, and knows what it takes to get people on board with creative content and talent.